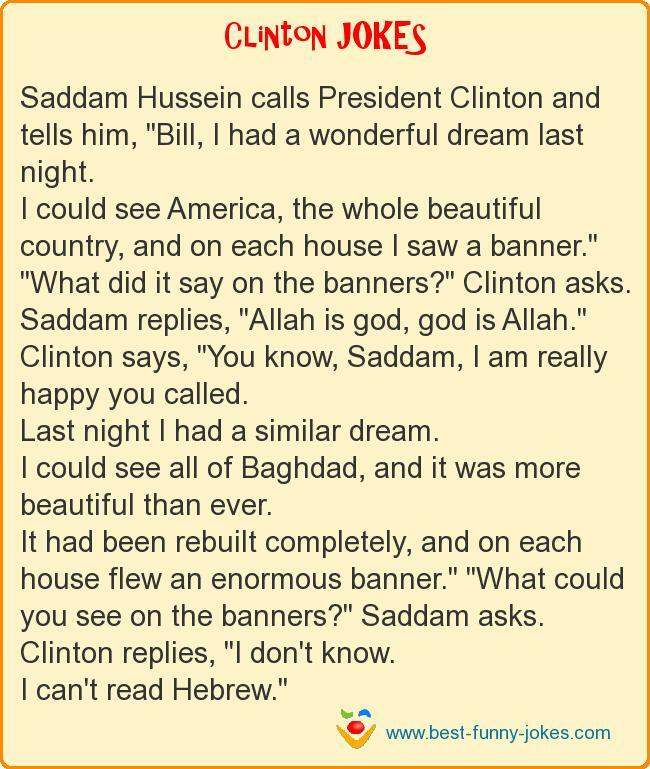 Saddam Hussein calls President Clinton and tells him, "Bill, I had a wonderful dream last night. I could see America, the whole beautiful country, and on each house I saw a banner." "What did it say on the banners?" Clinton asks. Saddam replies, "Allah is god, god is Allah." Clinton says, "You know, Saddam, I am really happy you called. Last night I had a similar dream. I could see all of Baghdad, and it was more beautiful than ever. It had been rebuilt completely, and on each house flew an enormous banner." "What could you see on the banners?" Saddam asks. Clinton replies, "I don't know.